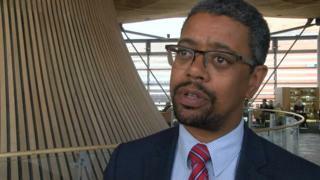 Image caption Vaughan Gething says the situation makes him "genuinely angry"
Money that would be used to improve healthcare is being spent "wastefully" due to UK ministers' handling of Brexit, the Welsh health minister has said. Vaughan Gething's comments follow the Welsh Government's purchase of a south east Wales warehouse to stockpile medical items in case of no deal. The facility will hold an "additional buffer" of stock to ensure essential health and care would continue. UK ministers were asked to comment. There are fears if the UK leaves the EU without a deal then extra checks at ports could lead to a backlog of lorries carrying essential items from continental Europe to the UK. "We're preparing for the very real prospect of a no-deal. We can't not do this," Mr Gething told BBC Wales. "If we did nothing and took a punt on no-deal not happening and it did, the public would quite rightly ask why on earth we didn't take steps in advance, and this is what it means - real money being spent. "I can absolutely look you, and anybody else, in the eye and say in normal times we would not have spent NHS capital on acquiring this warehouse. We would have spent it differently where there would have been a health gain." The Welsh Government would not reveal the exact cost of acquiring the warehouse but said it had spent "millions". The building is being used to store health care supplies including bandages, gloves and tinned foods. "We're being forced to use money inefficiently, we're being forced to use staff time inefficiently in a way that is genuinely wasteful and it doesn't just frustrate me, it makes me genuinely angry we are doing this because we could be making a much bigger difference to improve people's lives by improving our health and care system here in Wales," Mr Gething said. "We're being driven to take the time, energy, effort and money that we're spending to prepare for a no-deal because of the absolute shambles that is the UK government when it comes to Brexit." The Department for Exiting the EU has been asked to comment.